Five new publications from EMBARQ Brasil will help foster people-oriented cities with high quality public transport systems. Photo by Dylan Passmore/Flickr. In some Brazilian cities, poorly managed urban development has led to “3D” urban form – distant, dispersed, and disconnected. Over the past ten years, demand for urban public transport has decreased by 33% in Brazilian cities while car sales are on the rise. A number of Brazilian cities, however, are transitioning towards sustainable urban development and sustainable mobility. Last week, EMBARQ Brasil released five publications to support this shift and empower cities to move towards a “3C” development model – connected, compact, and coordinated. The publications will help cities create urban mobility plans, foster transit-oriented development (TOD), and improve the quality and safety of public bus systems. How can cities create urban mobility plans focused on people? 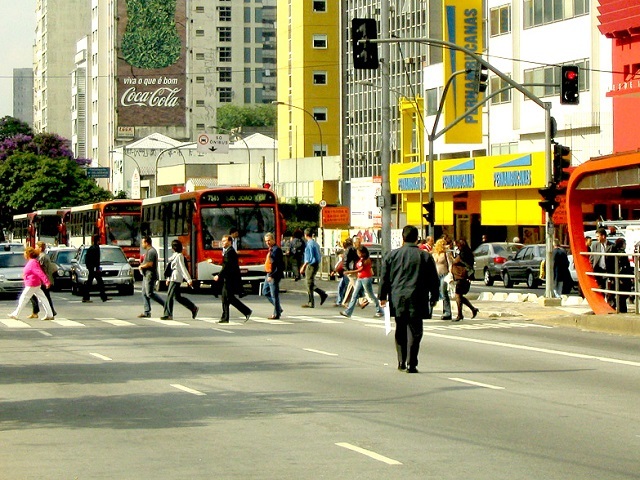 By next year, 3,065 Brazilian municipalities must develop urban mobility plans. EMBARQ Brasil’s publication – Step by Step Guide to Developing an Urban Mobility Plan (O Passo a Passo para a Construção do Plano de Mobilidade) – helps cities formulate mobility plans that fit their local needs. On the same day that it launched the publication, EMBARQ Brasil hosted the “Sustainable Urban Mobility Seminar: Practices and Trends.” At the seminar, Jesse Worker from the World Resources Institute (WRI) emphasized the importance of social participation in urban mobility planning. Governments must utilize new methods of engaging residents to create plans that are inclusive and transparent. São Paulo, for example, is using innovative methods to have residents contribute to urban planning and improve transport services. Through its MobiLab initiative, the city has created a crowdfunding platform to gather input for its master plan, and is opening data and sponsoring ‘hackathons’ to spur development of urban transport solutions. Quality public transport: High quality, affordable public transport is essential to connected, livable cities. Non-motorized mobility: Prioritizing active transport creates healthier, happier communities. Transport demand management (TDM): From parking regulations to congestion pricing, transport demand management strategies help orient cities around people, not cars. Mixed use and efficient buildings: By coordinating transport and land-use planning, fostering dense, mixed-use development around transit creates vibrant communities and uses space efficiently. Community spaces and active ground floors: Active, human-scale ground floors and community spaces promote social interaction and create a network of attractive spaces. Public spaces and natural resources: Well-designed public spaces can integrate natural resources and create attractive spaces for community interaction and social life. Community participation: Community engagement promotes a sense of belonging and encourages social interaction. There is a strong demand for improving the quality of public transport in Brazil’s cities, as evidenced by strong protests in the wake of transport fare increases and perceived non-productive investments leading up to the World Cup. EMBARQ Brasil – with financial support from FedEx – developed the QualiÔnibus program to study and improve the quality of public bus systems. The program released three publications last week – Satisfaction Survey (Pesquisa de Satisfação), Day One of Operation (Dia Um de Operação), and Safety First (Segurança em Primeiro Lugar). Satisfaction Survey investigates the most important factors in determining bus user satisfaction, and creates a standardized questionnaire that allows cities to compare the performance of their bus systems across a range of features. Day One of Operation provides a strategic guide for launching public transport systems successfully. The launch of a bus rapid transit (BRT) system impacts user expectations and has long-term implications on ridership. A lack of planning and communication with the public can create a negative perception of the system. This guide will help cities avoid common mistakes and ensure a smooth and successful system launch. Finally, Safety First creates mechanisms for bus companies to improve road safety management. It details three recommended stages – driver training for defensive driving, the implementation of incentive programs for driver development, and accident monitoring. This post was adapted from three articles on TheCityFix Brasil by Priscila Kichler Pacheco and Maria Fernanda Cavalcanti.